I am currently working on two titles that will be distributed through Handprint Press. 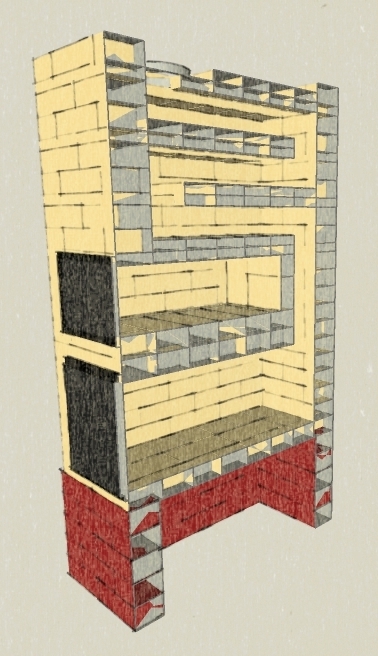 The first is tentatively called “Build Your Own Masonry Heater : A Plan Set for a Simple Russian Stove”. As the name suggests, it is a do-it-yourself guide for those interested in building themself something that will effectively heat a small home, shop, or garage. 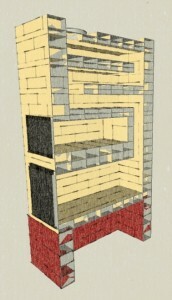 To the right, you see a section view of this basic masonry heater. As I write – in the middle of January – I am finishing the first full draft and sending it out to a handfull of people for review and editing. This booklet should be ready by the middle of February and will be distributed here and through Firespeaking Natural Building and Masonry Heaters. The other book that I am working on is about How To Build a Barrel Oven. 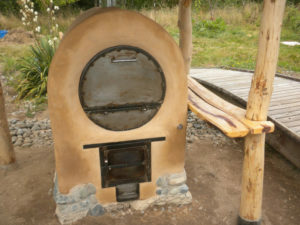 A barrel oven is a very exciting kind of wood-fired oven that is cheap to build, easy to use, and very efficient in its consumption of wood. 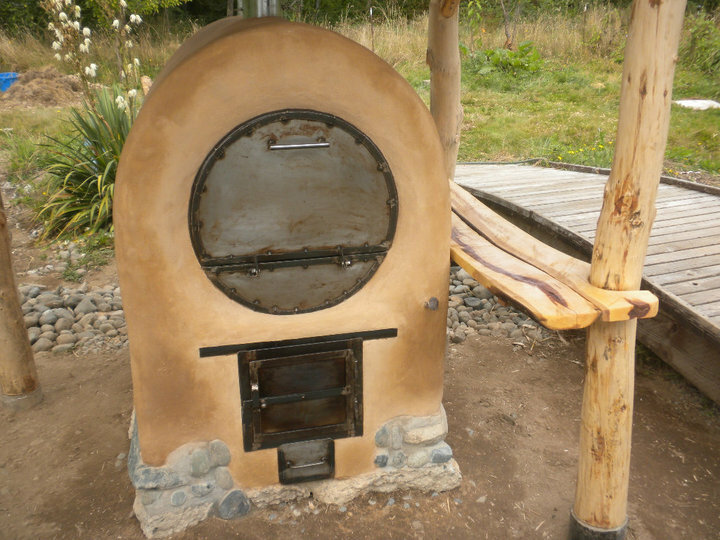 A barrel oven can easily be be the basis for a small-to-medium-scale bakery or related cottage industry. I am hoping to have the draft for this book done by March and will plan to launch it by mid-summer. I write because I am passionate about what I do, believe in it strongly, and believe the information I write is important and can be useful to others. I hope that providing this information can increase people’s choices and ability to make beautiful, functional things for their lives. But this writing is only really a ripple that emanates from my experiences as a builder, a mason, a farmer, and a member of a family and of various communities. You can find out more about what I do at Firespeaking Natural Building and Masonry Heaters. I co-authored a book about masonry heaters in France, out last year with the Terre Vivante Ã©ditions (www.terrevivante.org) which title is “PoÃªles Ã accumulation: le meilleur du chauffage au bois”. In this book, we try to give a general overview of masonry heaters: how it works, how to choose it if you want and can purchase it, and build-your-own stove, a building guide for self builders. We discovered masonry heaters thanks to Ianto Evans. In the end of the book, we give a commented bibliography, as big as possible. Soon the book will be re-printed and we are trying to ocnvince our publisher to include modifications and updates. I would like to mention your (future)book about self building a russian stove. Could you please give me some details about it? Do you hae any other books dealing with mass heaters that we should include in the bibliography? Wow!, Mari… thanks so much for writing. I first found out about your book through the complementary copy that you sent to Ianto. It is a WONDERFUL book. The best book, in my opinion, on masonry heaters. You and your co-authors do a great job of giving a general overview of fire and heating science as well as getting more specific about the design and building process. The builders’ work that you feature (Alex Chernov, Lars Helsbro, and Vuurmeesters) are many of my favorite fellow builders and friends. I think, most importantly, you transmit through your book how exciting masonry heaters are in our modern context – they are simple yet complex, they are technical and also significant occasions for beauty in the home, they are multi-functional heating and cooking sources, some are expensive and some are cheap, some are built by specialists and others by tinkerers. They are a rich and important part of our heritage as humans. The book is in French! So if you either read French or are passionate enough about masonry heaters to not see as this barrier and are willing to recall your high school French, I highly recommend this book. interested in rocket stove design and technology…wish to convert existing fireplace by chimney tear down to a rocket stove and looking for designs that will work for me.